You, Me and Movies: Review: Will "The First Purge" be known as a setback? 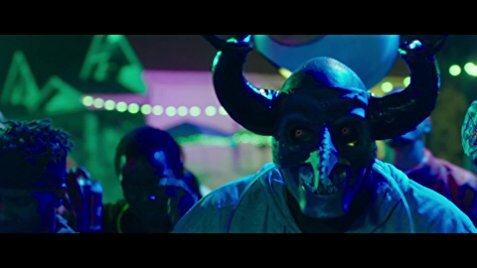 Review: Will "The First Purge" be known as a setback? I have felt for awhile now that "The Purge" movies have had potential for a fun B-movie franchise that I am not sure ever came to be. Sure, they've been monetarily successful, but with each new film, there has always been something missing. The first film was just an excuse for evil people to invade a house without the audience wondering where the cops were. It was one of that year's worst films. The three movies after that have begun to realize the fun to be had with the premise, but there is still so much about them that left me cold. The best of the bunch so far is "Election Year" the only film to ever hit the target so to speak. I thought these films would gradually get better. "The First Purge" seems like a huge step backward though. For the first time in the franchise, this new film is directed by Gerard McMurray. The brainchild behind this franchise is James DeMonaco, who has stayed on as a producer and writer, but was not in the directors chair. I figured some new blood as director may help this franchise, instead it had the opposite affect. I didn't find "The First Purge" to be very good. It's a horridly-acted, horridly-paced, politically confused film. It is a movie that suffers severely from prequel syndrome. We know the outcome, especially if we've been up to speed on this franchise, so all tension goes right out the window. This being "The First Purge," it outlines how The New Founding Fathers came to power and how they began annual Purges. Or at least, that's what the title would suggest to you. What I always wondered is how a vile party came to power in the first place, and the film brushes their origin aside like a fart in the wind. We know that third parties fail to get elected each election because their main causes get absorbed by the two bigger parties. I would have appreciated an explanation, no matter how obtuse, on how this all began. But the movie isn't interested in much explanation. The New Founding Fathers came to be because the story needed them to, and that's always lazy. We learn that Purges began life as an experiment in Staten Island. There was test run of the 12 consecutive hours of crime-free living. We learn that despite Americans being given the opportunity to commit crimes, how regulated and controlled the Purges were, even from conception. We follow drug dealers who see how corrupt the whole thing is and how an opposition forms from the early days. Basically, we have an hour and half of a big bag of obvious. There is nothing in here that I found very surprising. Nothing that I didn't expect to learn from the first place. I'd list actors, but the cast assembled is so embarrassingly bad that words fail me. Marisa Tomei shows up as the creator of the Purge, but she's in so little of it that it becomes frustrating. Steve Harris was one of the faces that showed up in lots of 1990's and 2000's movies, and I got excited when I saw him. But again, he's in so little of the film that it feels more like a cheat than anything else. There is such a small quality to the movie that it feels like a TV special and the cast assembled here actually feels like they are acting in a TV special. There isn't much here that actually feels like its from a movie. Except maybe a straight-to-DVD movie. The movie also tries its hardest to be provocative. But there is no heft or weight to the images here. There are purgers dressed as Klansmen. There is a scene where purgers dressed as cops gang up on a black man. These images are certainly haunting, but in a movie where a night is being designed to make crime legal for a short time, what do these images mean? They are reaching for the big metaphor here, but I am not quite sure what this imagery is suppose to represent. This series has always been about the rich against the poor, and how the rich finds ways to make poor people's lives miserable. I guess in a state of absolute control, people would be a lot more racist? I don't see how the recent trouble with police killing black people connects to the rich versus poor debate. And the movie doesn't do much to make that connection. If you've been a fan of this franchise, this might be the turning point for you. "The First Purge" is the first time in forever that I was totally agast by what I saw on the screen. It is just another prequel in a line of silly prequels that shouldn't have got made.